Q: Describe yourself when you were 10 years old - what did and did not you like, what problems did you make, and what did they praise you for? I had friends who were quite older than myself, was kind of a troublemaker, but did not have any problems with learning. The most common log in my school report book was: 'Talks back and disrespects'. That always got me into troubles at home, but I still liked to dispute my teachers. I would not say that. I am quite biased toward Litvinov, I was born here, grew up here, and so I don't see it as bad. Surely, when you drive by the factory, you probably would not feel that way, but the city has nice surroundings, the mountains are right behind the corner. But it's true that hockey is an important part of the city life. Q: Could you name what, beside hockey, still keeps you in Litvinov? Probably my nature. I am not a man who likes to move and change places. When I have to go to Prague - and I often go on business trips there - I don't feel particularly well. I don't like all that rush around me. Q: In 80's, you played 2 seasons in the NHL, two additional years in Switzerland, so financially, it probably would not be a problem for you to build a house close to Prague - which is what another famous Litvinov player, Vladimir Ruzicka, did. As I already said, it's my nature. And then - there was not a reason to leave. After all, I am not alone. Two other NHL and national team players - Robert Reichel and Martin Rucinsky - have been building their houses close to my place. Q: No other Czech club tried to lure you into transfer? Sure they did, but at that time, it was not easy to change the teams. Litvinov said no, we won't let Hlinka go, and that was it. Q: Did you regret that? Yes, but there was nothing I could do. I wanted to go to college, so I would have considered offers from Comet Brno or Sparta Prague, but eventually I was able to graduate even though I played here the whole time. Q: During your career, in 70's and 80's, we watched matches against USSR, the country of our occupiers, with understanding that the players could legally do to the Russians what the ordinary Joe couldn't: ridicule them, put them into the position of losers, and also occasionally strike them or throw them into the boards. Our motivation during the games against Russians was both political and sport-related. They had a consolidated team and outstanding players. We had too, and so it was known from the start that Jarda Holik would mess up with Ragulin, that Yakushev is an intelligent player, Mikhailov is a little different… Fans knew that and always were looking forward to the unique atmosphere of those games. Q: People say that there was quite a lot of name calling involved in those games. Soviets apparently called you fascists. What did you call them? Hockey players call each other names all the time. Even today. But it was always a little worse at that time. Also, there were many really bad fouls in those games. Fouls that the referees usually didn't spot, but those hurt even more. Q: Do you know any Russian swear words? I can speak Russian pretty well. If you want to hear a swear word, here you go - durak. Q: Going down the memory lane, in the league, on the national team, as well as in the NHL, your inseparable teammate was always Jiri Bubla; they even called you "Litvinov twins". How do you explain that he actually stayed overseas. Jirka has a tougher nature, in addition, he had both a perspective and a desire to play in the NHL longer than I did. We came to Vancouver when we were almost thirty-two, he is a day younger than myself, and after my departure he played there for five more years. He was simply a bulldog. Q: What do you know about his problem when he was arrested in Vienna airport while smuggling drugs? That happened at a time when he no longer played in the NHL, and worked as a scout. I was surprised by that, I don't know any details, apparently, he spent four years in jail. Q: Are you in contact with him these days? We saw each other several times lately. We call each other occasionally, recently he called and asked me to send him some coaching literature, because his youngest son plays hockey. He used to have a nice coffee house in Vancouver, but apparently he sold it, and thinks about different projects. He is OK, stopped smoking, which is something I envy him. Q: As a Litvinov patriot, you probably did not think much about defection. To start a new life in a different country at the age of 34 is tough, almost brutal. In addition, I just finished building my own house in Litvinov completely by myself, and I would lose it. And finally I have to admit that I would not move out of here even if it were to Budweis, and they sure get more sun than we do. Q: Don't you have a 'soft spot' for another Bubla's son, the current national team defenseman Jiri Slegr? Or can it be said that way? Yes, we can say that. My son is exactly as old as little Jirka, they have been friends since childhood, and went to school together. Q: In what is Jiri Slegr similar to his father. What makes them different? Q: Do you regret that your son Ivan did not become a hockey player? Every father likes when his son carries the torch, but if it does not happen, nothing can be done. Ivan played hockey, but when he was fourteen, which is the most crucial time, he was too short, his puberty still had not started, and that was a disadvantage. If I remember well, Ivan and Martin Rucinsky were both short, and now they both out-grew me. Martin was more skilled, though, so he was able to get through this time and continue. Ivan got delayed. In addition, he constantly heard around himself: "That's Hlinka, that's Hlinka…" so he was also under a lot of mental pressure, which did not help him, either. So he switched to cycling. He was not good enough for the top races like Course de la Paix, but he raced professionally in Dukla Prague and Dukla Louny. These days, he is into business with sporting goods. Q: There are two million school kids playing hockey in Canada, whereas Czech Republic has only thirty thousand young hockey players. How come starting from such a small base, we are able to develop players that won "the tournament of the century"? Yes, the majority of Canada is cold, they have ice and snow seven months in a year, every boy has skates and a stick and plays hockey, but their training lacks quality. Canadians don't have sport schools, like we do, where third-graders practice five times a week. My son played for two years - in fifth and sixth grade - in Vancouver, in a pretty good club given their standards, so I am able to compare. Q: Several years ago, we had a tennis boom. Parents, motivated by fairy-tale profits, wanted their kids to become new Lendls. Isn't something similar going to happen to hockey after Nagano, and after the articles about salaries of Haseks and Jagrs? Hard to say. One thing is certain: hockey has become a very expensive sport. For example, an average hockey stick costs 6 hundred crowns. An eight-grader breaks 10 of them in one season - that's six thousands crowns. In addition, in the majority of clubs, parents usually have to pay traveling costs, the ice time, coach's salary. Here in Litvinov we try to prevent that and we invest into our youth. We know that the most skilled boys tend to grow up in poorer families and conditions, their dads don't drive them in mercedeses to the practice and they don't buy them Jagr's jerseys. By the way, Jarda Jagr grew up in pretty tough conditions himself. There is a danger, though, that the boys from poor families will eventually be forced to play soccer or handball, because they need just a T-shirt and shorts to play that. Only richer kids will end up playing hockey, and that may affect its quality in a negative way. Q: Your skepticism regarding the future of Czech hockey is known. You don't like that agents lure our best players to Canada and the US when the guys are just juniors. I am not at all against Czechs playing in the NHL. But it is not normal for the Czech clubs to spend tremendous amounts of money on training of young players, and at the moment when this investment is about to start paying off to lose those guys. And completely free of charge. It happens quite regularly that a 17-year old player leaves for the US without any compensation or even saying goodbye. The club will then quite logically ask: Does it even make sense to develop young players? This can really lower the quality of our hockey in years to come. Unfortunately, absolutely nothing. The fact that there are not that many young players leaving from Sweden, Finland, or Switzerland is due to the economic power of those countries. If Czech clubs could pay their players at least as much as the teams in those countries, then the players that don't make it into NHL would play at home instead of wasting their time in the minors overseas. Q: Let's move to your coaching. Where is the secret of your success? Definitely in the natural authority. The players have to respect their coach as a person. And he has to persuade them that what he wants from them sometimes hurts, but it is still necessary for them to do it with an enthusiasm and interest. The players like hockey, otherwise they would not play it, but not always they go on the ice motivated to the maximum. Q: Do you pay attention to how to behave in front of the players? That, for example, you can't light your cigarette or have a drink in certain moments? Or do you have such authority that you don't even think about it? I don't smoke where it is not possible. In the locker room, for example. But on the other hand, I don't hide with a cigarette. I smoke, that's my mistake, and so I can't prevent my players from doing the same thing. Q: But don't you act as a bad role mode, so to speak? Maybe yes, but as far as I know, there are just three smokers on the national team. I think that the guys are in this regard much smarter compared to my generation. Q: What can a player do to impress you, and, on the other hand, what behavior do you hate? Can I just say the negatives? I don't tolerate alibists, who for various reasons sort of play and don't play. The players who don't want to take on the responsibility when the team does not play well, and who hide just so that the loss can't be their fault. The player who does not try, does not make mistakes. If you have more of them on your team, you can hardly win. Q: It is said that excellent athletes, including hockey players, have to be a little bit of a troublemaker, conflicting types. Do you agree? Yes. Though the question is what do we mean by a troublemaker. I'd rather say that a good player is one who remains mentally a boy for a long time. That way, he likes to play, and occasionally creates some troubles. Q: Do you know any exceptions? Can a player be Mr. Perfect? Everybody does some good and some bad things. Not always the whole team sits down, listens to the coach, and then does what the coach wants. Every player has his ways and his approaches to perform well. Sometimes they are quite different, and the coach's challenge is to combine everything in order to win. Do you want to hear who is the good guy on the national team and who is the SOB? For example, Robert Reichel knows how to perfectly prepare for a game and he will do everything to show 100% performance. By that I mean both training and the diet regimen. On the other hand, there are guys who occasionally break some regimen rules, which may be actually good, even though it sounds strange. When the players are aware that they made a mistake, their attitude toward the game and the practice will improve. They want to undo their wrongdoings. What I hate, though, is when a player violates something, does not want to admit it, and on top acts offended. Q: What was the most important factor during the process of creation of the team for Nagano? To find out whether the people that we counted on want to play and how much they are looking forward to playing during the Olympics. So it was necessary to talk to all of them and see some of those guys playing. A lot of has been written about NHL, and not everything is true. Sometimes a puck bounces off somebody, he scores two goals, and journalists immediately start writing that he should play for the national team. In case of a few players, we had our doubts. He grew up in Litvinov, I remember him since he was a small boy. He used to play tennis with his father, the secretary of our club, and he always cried when he lost. That's what I appreciated about him. Then, I highly appreciated what he was able to do for his career; he defected at the age of 18 with the single goal - to play in the NHL. He has the kind of nature that can't be broken easily. Q: So what kind of place did he have in the framework of your team? One of the key ones. A person who will lead his teammates. But not like he would come and say 'I am the boss'. He was a guy whom everybody respected in advance. Besides, Petr was perfectly familiar with all the Canadians and Americans, he knew what one can and can't do to them during the game. That was crucial. We used to lose to those teams in the past a lot, simply because we did not know about them or because we were afraid of them. Other key players were Hasek in the goal, and thirty-five year old Vlada Ruzicka who was substantially older than the majority of the players and carried a lot of authority. This played a big role, too; superstars like Jagr, Rucinsky, or Reichel used to be a little jealous of each other in the past, but all of them respected Rosie very much. Q: What does remind you of the Nagano success here in your Litvinov stadium office? I don't care about those things much, but I should have some banner here…. Yep, it is here, laying on the shelf. A samurai sword, and a china-glass elephant. One of those elephants used to be our good-luck charm, and everybody had to pet it in the locker room before each game. After the Olympics, they made a copy for each of the players and coaches. Like every other guy - I lay on the coach, read, watch some TV. Or I lock myself in the garage and do some carpentry. I have been telling myself that I should get into painting with a 'full-force', but I haven't managed to do it so far. It requires time, the right state of mind, ideas, determination. If all of the above comes - I don't know a better way how to forget about the problems. Q: Which of the famous painters is your favorite? I like the paintings of Salvador Dalí. Q: When did you start with painting? Near the end of my hockey career, because I felt a little bored. I was playing in the Switzerland, I used to be alone a lot, so I bought some paints, brushes, an easel, canvas, a couple of textbooks and started from there. Q: What was your first paining about? A portrait of my son. With a tear on his face, because his dad isn't home, again. Q: Can you describe your best piece of work? There is a clown standing in the locker room, and he looks with sadness at all the jerseys of the teams he used to play for. People quite like it. Q: One could try to find some autobiographic dimension in it. Have you ever been a clown in the classroom or on the team? That's something I can't really judge. Q: And what about the last paining? Again, a sad clown. I no longer have this one; I gave it to some friends. Q: Do you like clowns and circuses? I absolutely hate going to the circus, but I really like the character of a clown. 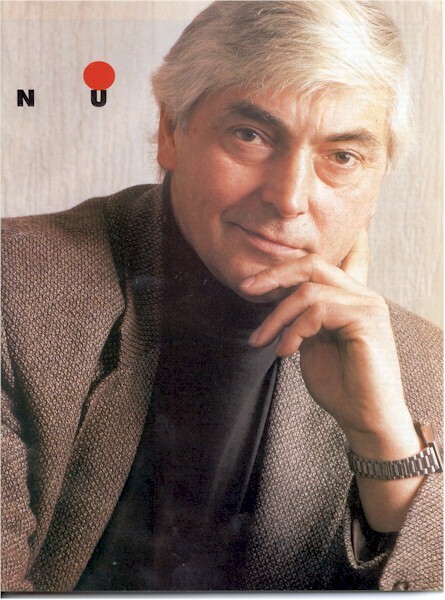 After all, Jan Werich [a famous Czech comedian] proudly called himself a clown. A clown has a personality, he is not just a simple joker, he has his humor, but he has a lot of compassion, too. Q: What is your role in HC Litvinov? I am both a GM and a president. My contract is with the club, which is a direct subsidiary of Chemopetrol Corp, so I am subject to the internal rules of the company: like every other company manager, I can sign only a 1-year term contract. This contract can be renewed every year, or I can be terminated. The purpose is to show the managers that 'nothing is certain' until they retire. Q: And you do want to do this work until you retire? Definitely I want to continue doing something related to hockey, because to change careers completely at my age would be very difficult, and frankly, wouldn't bring anything positive. 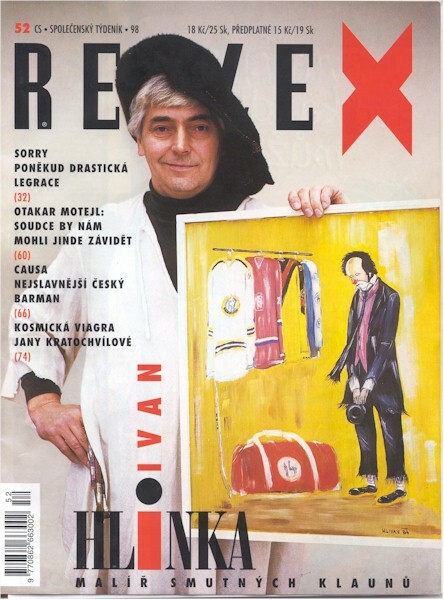 Ivan Hlinka, Dipl.Ing. [M.S.] (* 1/26/1950). Played hockey for CHZ Litvinov (1959-81), (with the exception of ½ of a year in Dukla Trencin (1978); Vancouver Canucks (1981-83), EV Zug (Switzerland, 1983-85), and once again Litvinov (1986-87); scored 347 goals in 544 games in the Czechoslovak 1st league. Graduated Prague School of Economics (1977), since 1985 a coach and/or a manager in Litvinov. Represented Czechoslovakia during 11 World Championships and 2 Olympics: 256 games (132 goals), a three-time world champion - 1972, 1976, and 1977. 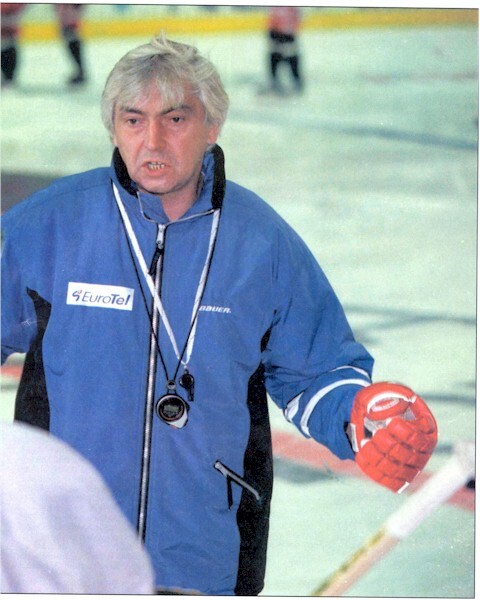 Coaching achievements: 1992 - 3rd place of the Czech and Slovak Federative Republic team at both World Championship and Olympics. 1993, 1997, 1998 - always the 3rd place of the Czech Republic national team at the World Championship, 1998 - 1st place of the Czech Republic national team at Nagano Winter Olympic Games. Hobbies: tennis, mushroom-picking (with a cell-phone ringing not as much fun as it used to be), and oil painting. "Only three players from the Nagano team call me by my first name - Hasan, Rosie, and Hedgehog," says Ivan Hlinka. A 'Hedgehog' is a long-lasting nickname of Petr Svoboda.